Grab the keys and get set to unpack your boxes. It’s time to move into the future. But before you cross the threshold and command your robo-butler to get the kettle on, take a moment to stand back and admire this feat of engineering. First off, traditional clay bricks are out. Future houses are likely to be eco-friendly, eschewing CO²-heavy manufacturing processes. Your home might incorporate building blocks constructed from natural cement churned out by bacteria (1), or be fashioned from fungi – indeed several companies including MycoWorks and EvocativeDesign are exploring the potential of mushroom-based materials. Alternatively, if retro-chic is your thing, super-insulating straw-bale panels appear to be in for a renaissance, while new developments with aerogels also promise a well-insulated abode. Roofs, too, will be working hard. Among the innovations that could take off are super-reflective tiles for those in scorching climes and, for the rest of us, biosolar roofs that combine habitat for pollinators with energy-generating panels (2). Self-cleaning finishes, already on the market, are in for an upgrade too. Building on the well-established grime-busting properties of titanium dioxide, researchers are developing paints to keep your exteriors glistening even when scratched, scuffed or grazed (3). That sweeping driveway, by the way, is not going to be made of crunching, scrunching gravel. Oh no. Taking inspirations from Dutch plans for highways constructed from plastic waste scooped from the sea (4), your drive could be heated to avoid winter snow-shovelling and have charging stations for your electric self-driving car (5). The path to your front door, meanwhile, could be embedded with tiles like those by Pavegen (6) that can turn your visitors’ footsteps into electrical power. Although with companies such as Google promising deliveries by drone (7), and Starship wheeling out dumpy-looking free-to-use delivery bots, the postman won’t be beating a path to your front door for much longer. Your garden is also likely to see a fusion of tradition and technology – devices such as Blossom already monitor weather reports to regulate the watering of your lawn, while robot lawn mowers will keep it neatly trimmed – but the burgeoning field of digital art could finally allow you to jettison the ugly water feature and augment your lawn with beautiful and changeable statues and soundscapes created in virtual spaces (8). For the flower lovers, multi-sensor gadgets such as the strangely shaped Parrot Flower Power and the Koubachi Wi-Fi Plant Sensor will keep tabs on everything from soil acidity to temperature, although, given that plants have coped on this planet for more than 700 million years without them, you might be as well served with a trug and a cup of coffee. And if you are still worried about keeping up with the Joneses, at least you can stop rustling the net curtains: firms like Sonte claim their WiFi-enabled digital shades can be switched from opaque to transparent at the push of a button (9). Sometimes it seems our appetite for tech knows no bounds. So perhaps it is small wonder that kitchen innovations are moving swiftly on from a lightbulb in the fridge and softly, softly closing drawers. Pop in the raw meal and stand well back as its intelligent systems recognise the dish and know exactly how to cook it. 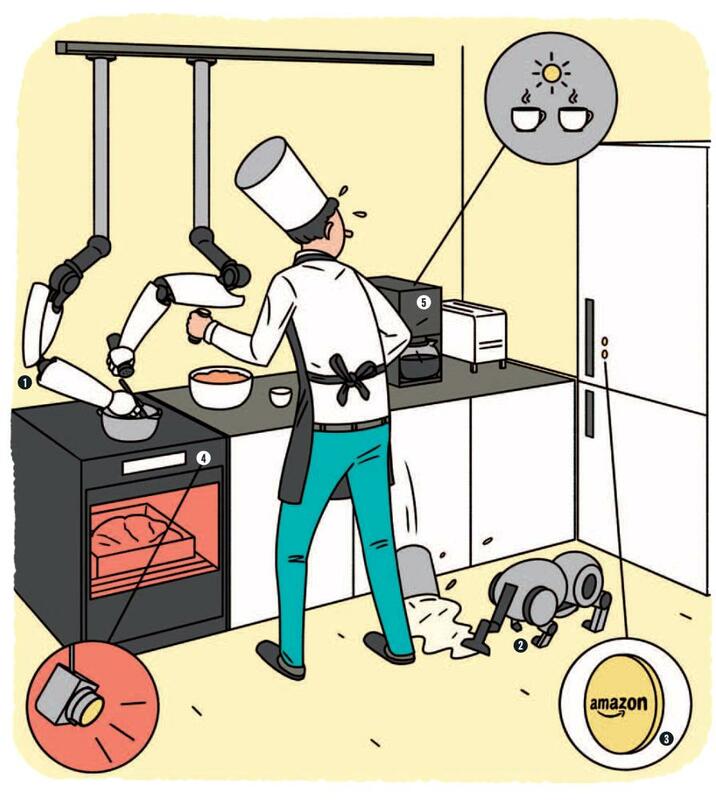 One thing that’s certainly on the menu is a spare pair of hands to wield the pans – be that a fully robotic chef like Moley (1) that can, by motion tracking, replicate your Jamie Oliver impression to a T or the fetching-and-carrying Care-O-Bot4 by Fraunhofer. Not only can the latter turn up with a colander but it can also do the laundry and, apparently, garnish your breakfast tray with a red, red rose. If you are so inclined. And it’s cheers all round as be-splattered recipe books and pastry-flecked screens get the boot in favour of hygienic upgrades. Among them is a nifty vertical recipe projector, suggested by Wan-Ru Cin for the James Dyson award and an even smarter system dreamed up by students at Lund and Eindhoven Universities that not only projects recipes onto the work surface but also uses a canny array of cameras to detect ingredients and offer culinary suggestions accordingly. The kitchen is occasionally the domain of the muppet chef, but there too technology has the answer to lobbed tomatoes, dropped cheese and mishaps involving flour. Enter, on all fours, the Instinct Vacuum cleaner. The as-yet unmarketed brainchild of Australian Berty Bhuruth, and resembling a bull terrier with a vacuum for a head, it’ll 3D-map the room before hoovering up the mess (2). Not every kitchen aid will have limbs. Taking Amazon’s Dash button (3) to its logical conclusion, smart fridges brighter than the recent Budlight offering seem probable, although given the LG ThinkQ is no longer available it seems having your fridge in cahoots with both your phone (for notifications of low supplies) and your favourite supermarket (to reorder) might not be the way to go. Ovens, however, are in for a renaissance. Electrolux’s upcoming ProCombi Plus Smart oven (4) will offer cooks the chance to cadge a sneaky peak on a rising cake without making the rookie error of opening the door, while smart oven June isn’t leaving anything to chance. Just pop in the raw meal and stand well back as its intelligent systems recognise the dish and know exactly how to turn out a perfect result. Of course the one appliance we are all hoping to see upgraded is that bastion of the 1960s, the Teasmade. And, behold, it shall be done. Budding technologists have devised a smart coffee machine (5) dubbed the smarter.am (app controlled, of course), while innovation has been brewing on Kickstarter with offerings such as the Qi Theteamaker that adjusts temperature and steeping time to the leaves used. Teforia, meanwhile, has just launched a robot that can adjust antioxidant caffeine levels to taste, although the price tag of $1,300 might be harder to swallow. With a kitchen bursting with such intelligent devices, there is always the chance your microwave might actually become your best friend. But beware. As Simone Rebaudengo’s cheeky design for Brad – the toaster with self esteem issues – reminds us, you don’t want your appliances getting jealous. Morning ablutions might seem a private affair, but that could all change as technology finds its way into the smallest room in the house. Among those vying to keep an eye on your vital statistics is Withings, whose “Smart Body Analyzer” (1) makes your old nemesis – the bathroom scales – look positively friendly. Claiming to measure your weight, body fat, heart rate and BMI, it will not only terrorise your tiled floor, but take to your phone: an accompanying app tracks your activity and adjusts your calorie budget for the day to meet your health goals. Think that teatime biscuit looks good? Think again. Even that most benign of bathroom essentials, the humble loo, is in for an upgrade. Smart toilets (2) have already hit the stores, with American firm DXV anticipating what it somewhat alarmingly terms a “contemporary movement” through its heated seats, night lights and remote controls. But alternatives are already in the offing that can monitor your bodily extrusions better than an over-competitive parent. Japanese company Toto has unveiled its Flowsky toilet that keeps tabs on your rate of gush, while MIT SENSEeable City Lab is working on a loo that can not only recognise the be-throned, but analyse their excrement to shed light on the state of their health and microbiome. The bathroom might well become the domain of Big Mother. Water-wasters will be chivvied by warning lights thanks to devices like Drop from Qonserve Technologies that displays a red light when the taps have been left running, while bathroom hoggers will be ousted by “water pebbles” (3) that can be programmed to flash red when bathtime’s up. Baths and showers too will be cleaning up their act, with Orbital Systems developing filters to recycle water as it is used and Nebia offering a water-saving shower based on an intense mist of water rather than a traditional deluge. And our towels might even be cleaned without H2O: designer Leobardo Armenta envisages a nifty device that eschews the washing machine for a doughnut-like contraption with a fan to dry the towel and UV light to kill bacteria. 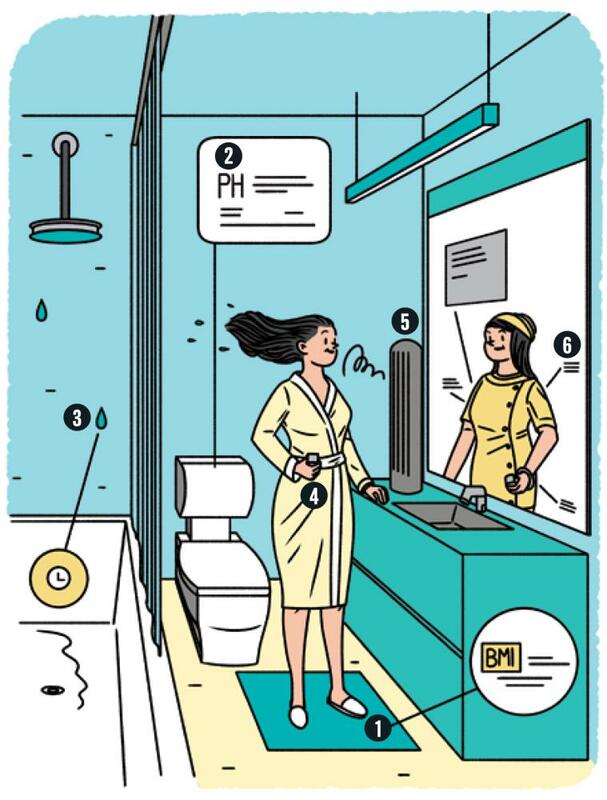 Not that every bathroom gadget has the eco-system at heart. Pampering 2.0 will be based on a range of hi-tech devices from OKU (4) – a handheld gadget that scans your face and recommends a personalised skin care regimen to state-of-the-art hair dryers, like the simple and stylish idea “Column” concept that allows you to shout: “Look no hands!” while heating up your barnet (5). IOdigital meanwhile is hoping to corner the market for a home “digital spa” offering an interface through which you can programme your ideal bath or shower – although if you’re after some musical accompaniment to your washroom serenades you might prefer Moxie’s shower head with integrated Bluetooth speakers. The mirror, mirror on the wall, might finally talk back too if AI holds true to its promises. A suite of tech companies are devising prototype smart mirrors (6) to offer advice on everything from wardrobe choice to makeup, together with news and weather updates. Let’s just hope they’re smart enough to know when to tell a little white lie. And for those who aren’t content with merely embracing the future, but want to own it as well, Transylvanian designer Kovács Apor has the answer on his drawing board with a wall-mounted contraption that turns plastic bottles into stylish togs. Indeed in the future it seems your conscience, as well as your body, could be squeaky clean at the push of a button. The living room is all about kicking back and enjoying yourself, so why not start your weekend wind-down with a cool glass of something festive, ferried to your side by your very own Robo-Carson? Android helpmates are already being used in hotels around the world, such as the Cupertino Aloft Hotel in California, where two “ALO Botlrs” deliver items to guest rooms, such as extra towels or room service items. Such robot helpers (1) are likely to become ever more sophisticated, capable not only of fetching the port, but also having a jolly good natter. But you might still want to run interviews for the job: RobotButler Inc’s creation – described by the company, somewhat bafflingly, as being “beyond intelligent” – looks positively sinister. Perhaps a more endearing companion is the robo-pet. The ultimate conclusion to a trend kicked off by the Tamagotchi of the 90s, these zippy creatures – such as the long-awaited Miro (2) – will not only zoom around like their flesh-and-blood counterparts, but also incorporate machine learning so that they adapt to understand your commands with nary a doggy treat in sight. Also keen to hang on your every word will be AI systems – building on devices like Amazon Echo (3) – that will not only give you a running commentary on news headlines, answer your questions and carry out a host of admin tasks but also let you know what the weather is up to. Although we’re pretty sure the house of the future will still have windows for that. Not every advance will be artificial, however. Hoping to clear the air, as it were, designer Ankit Kumar puts the aspidistra in its place, envisaging an interior bedecked with grass panels (4) to purify your lungfuls, while innovation company Hyve is planning to get your blood pumping with its interactive virtual-reality gym platform (5). Dubbed Icaros, the contraption “combines your workout with a unique flying experience”. Which makes the humble exercise bike seem remarkably pedestrian. 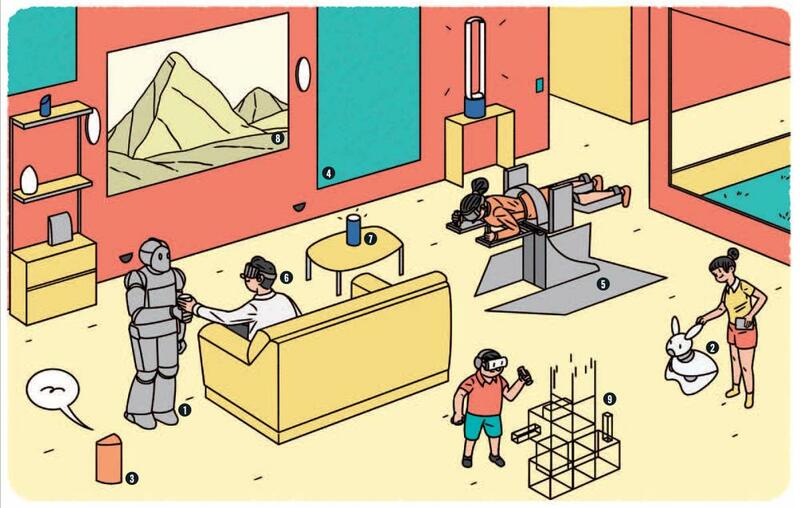 With VR headsets (6) becoming cheaper all the time, even the most benign night in could be transformed. Couch potatoes could become globetrotters, as digital devices transport them to a wild expanse of David Attenborough’s latest vista, while immersive sound recordings, ultrasound haptic devices and internet connected scent cartridges (7) turn a visual feast into a multi-sensory smorgasbord. Not that your telly will bear much resemblance to your current black box in the corner. Ultra-thin OLED displays – like LG’s flexible “wallpaper” (8) – will allow us to attach, or peel off, our screens from mounted magnetic backing while holographics, fuelled perhaps by devices like Microsoft’s HoloLens (9), will bring characters and objects into your living room through augmented reality. But beware. Much as we would all like to meet Mr Darcy in the flesh, advertisers will no doubt be quick to spot the benefits of letting customers get up close to their wares. Technology and sleep are unlikely bedfellows: for years scientists have been wagging their fingers at those who go to bed in the company of the dazzling blue lights of their connected devices. But when it comes to hitting snooze-mode, technology need not be a nightmare. White noise generators such as those produced by Ectones are already available, offering the chance to drown out frisky foxes, chirpy birds and bickering kids with the comforting sound of a fan or pattering rain. But that’s a drop in the ocean compared to what the future could hold. Rather than one speaker tucked in the corner, why not drift off into an immersive, self-sculpted 3D soundscape – waves lapping at your feet, palm trees rustling above your head, your left ear caressed by the caw of a parrot while the beat of a hummingbird’s wing flutters in your right? It might sound heavenly but, as installations by sound artists such as Martyn Ware have shown, it’s also practically possible. Better still, with the advent of directional audio devices, like those by Dakota Audio (1), able to beam sound with laser-like precision, your companion could simultaneously be transported to quite a different setting, be it a blustery Arctic tundra, bucolic pasture or the inside of their dream smart car. And if all that makes you want to take a nice deep breath, then you’ll be glad to know that air quality is set for an upgrade too: smart monitors such as the Foobot and Birdi (2) are already for sale, able to track everything from toxic gases to pollen and even volatile organic compounds (although whether they can sniff out musty socks yet isn’t clear). Quite when these will be hooked up to purifying systems is still up in the air but, while you’re waiting, why not ditch those 60-watt bulbs in the bedside lamp? Bioadaptive lamps (3) are already planned – one system was recently installed at the Technology & Innovation Centre of the University of Strathclyde. Tuned into your body clock, or “circadian rhythms” as those in the known call them, they could gently lull you to sleep, or wake you without a jolt. For those seeking to monitor every biological process, you can go a step further, starting with the smart mattress. 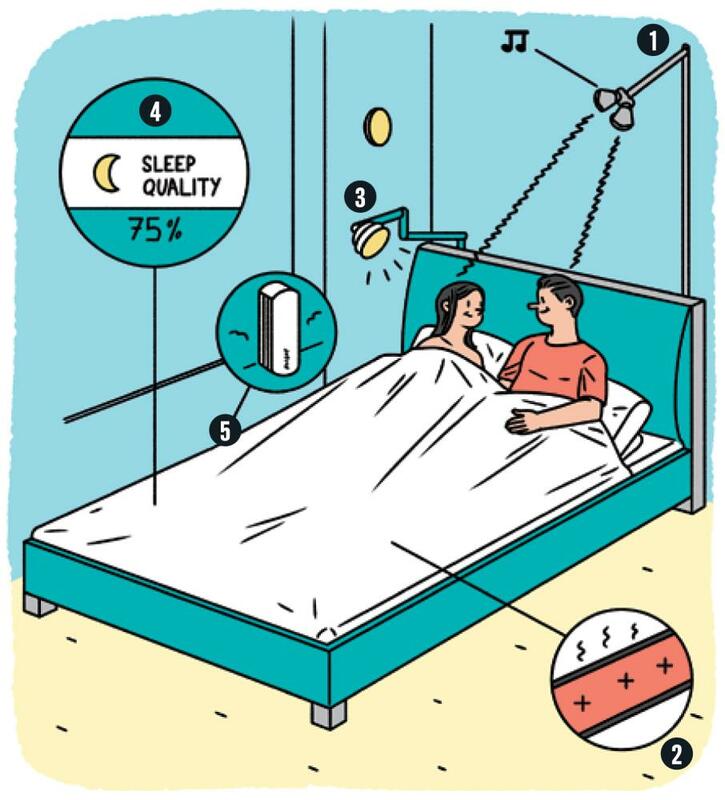 As well as tracking sleep patterns, (4) breathing rate, heart beat and anything else you might get up to under the covers, the Eight mattress cover will also nudge you back to consciousness at the most opportune moment of your sleep cycle. And that’s to say nothing of the wonders such tech could work for the marital bed, from sending its occupants notifications that Eros has not seen much action lately – as Dunlopillo is planning – to hotting things up with precision heating coils – (5) Eight again – and even rearranging tousled sheets in the morning with a sleek pair of mechanical arms as Ohea envisages. But if it’s truly an analogue 40 winks you’re after, why not try a set of Wi-Fi-blocking drapes, such as those imagined by Ikea? Yes, you’d have to knock up a canopy contraption and invest in a wind-up alarm clock but you’d be nestled in a cocoon of peace, with nary a Snapchat alert to wrest you from your slumbers.